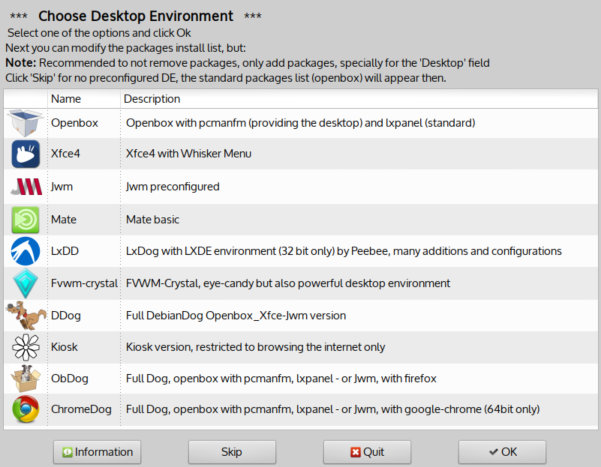 Should work running from any Debian based OS, I tested on Stretch Dog 32 and 64 bit. Update 2017-08-18: Without option (such as: -gui will show the help text, GUI and CLI options available now, and use of external config file. Took for me 15 minutes to create ISO, size: 164 MB (xz compressed squashfs) on a 10 year old HP laptop (dual core) and a medium fast internet connection. This may not be considered as just a howto, but as a project that can grow, e.g. extend the script by calling other scripts e.g. for having choice of different window-managers, desktop environments, applications. Better use of git may be the best (but not my strongest point). So development depends on the interest, feedback and help from anyone. This is anyway some sort of base concept (that can be changed also, of course). Thanks to everyone who recommended debootstrap, it's a very convenient and fast method. - Fixed bug that it worked well only from an OS with the same kernel version as the default Stretch kernel version. 2017-11-03 Added question yes/no at start of build to run Xterm after the install process. I ran it from Stretch 64 and it absolutely seems to work. I removed midori, lxpanel and synaptic from the list and got an ISO of about 130 meg. The filesystem01.squashfs file was less than 100 meg. Installed it as porteus boot save on exit. Save to flash worked. It doesn't really do anything though. . . I caught myself before I did it, but I imagine you don't want to run it from /root since that would fill up your ram memory and crash. Instead run it from the linux partition. Right? I'll play with it some more later. edit: I made another one. Then I installed all the deb dog specific scripts. Ran the quick remaster and it worked (used gzip, because you didn't say anything about lz4 working). The only issue is that I somehow broke (or maybe just couldn't figure out) the network for my ethernet. Is there a file I should delete during the remaster to reset it or ??? Any way, this is a great accomplishment, alhough I'm not sure I'll be able to build anything I'll like better than your standard one. My understanding of this is that it uses Debian debootstrap script to create a minimal Debian Stretch install in a chroot environment? And the rest of the script then adds to that to include Porteus boot and all the other Dog-related extras to create a Dog out of the debootstrap base? This method of producing Dogs certainly seems to be a positive way to go. This may not be considered as just a how to, but as a project that can grow, e.g. extend the script by calling other scripts e.g. for having choice of different window-managers, desktop environments, applications. "Any way, this is a great accomplishment, alhough I'm not sure I'll be able to build anything I'll like better than your standard one"
Hi belham,Fred and everybody ! You are a man of action Fred. Smells like an interesting/exciting new Game/Kick. Although i dont have any clue of how this is working i am going to start the engine and follow your instructions to to see what happens. I am sure it is worth to keep an eye or maybe two on it . It creates new /etc/apt/sources.list and includes the right (stretch)dog repository depending if it's 32 or 64 bit build. The ones ending with -stretch are used by the script, the tarball: https://github.com/DebianDog/MakeLive/blob/gh-pages/dog-boot-stretch.tar.gz?raw=true has the porteus-boot files and config files e.g. for autologin, sources.list and much more (these are all copied by the script to the chroot). "Which browser to include ? ": 1) firefox 2) chromium 3) midori ...... *) "No thanks, I hate browsers"
But perhaps the best thing to do first is to extend it with more handy dog applications, e.g. filemnt, sfs-load, lz4 support etc..
As always, any suggestions are welcome. @backi, it's really easy, open a terminal on some linux partition, sda* (with at least 2GB free space) and run the script. Followed your main instructions . can`t setup union(aufs)-read only filesystem? I agree with this. It seems like the basic Debian Dog functions, create an sfs, mount and use an sfs, edit an sfs, and remaster could be included just listing the appropriate apps in the list at the top of the script. Since you can delete midori and add firefox-esr or whatever, I am not sure browser choosing needs to be automated much more than that. Anyway I think I will implement in the script a check for at least 2.5 GB free space and otherwise exit. Yes, indeed those kind of special dog applications should be included (and implement right-click actions for filemanager associations). I agree, a browser can be easily replaced, so better think about including choices that are not straight forward to do by a user. Removing /etc/rc.d, /etc/DISTRO_SPECS, and /initrd in remasterdog and remastercow scripts is sometning I insisted to include to prepare DebianDog for puppy-boot option (using initrd.gz from puppy with debian kernel). Better remove the lines above from the scripts to make easier puppy developers to keep the same structure for packages like peasywifi (inside /etc/rc.d for puppy and dog based system). Porteus-boot and live boot will not create /initrd or /etc.rc.d (both are puppy specific for important configuration files). Nope, sadly, I didn't confuse them. Well, the build process seems to go great, gives me the big "OK" at the end. But nothing I can do will get either of the two builds I did to boot up. Will try tomorrow----maybe will swap out stuff from Trinity Stretch and see if the problem is either the vmlinuz and/or possible the initrd1.xz (my betting money would be on the initrd1.xz). - 01-filesystem.squashfs, what's the size (from right-click > How big ?)? - From what OS you did run it ? - Enough free space on the partition you build on ? Since dancytron and I didn't have the problem, I'm thinking in the direction of missing packages (failed download through https, ISP issue ? ), and apt-get possibly refuses to install anything if one or more packages it cannot find. just guessing though. We'll see later tomorrow. I just don't have words to tell you how much fun this is and was. 20 mins to build on a very slow amd single-core Sempron from 2005, it still took only 20 mins. On faster machines, it will move below 10 mins! And to think of the customizations that can be done to this build script.....the ideas going off in my head are so numerous it is going to explode Well done, my friend, very, very well done.